Yatahay! 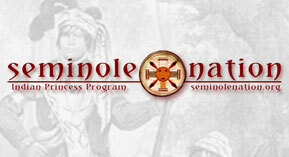 Welcome to the YMCA Indian Princess Seminole Nation serving the northern quarter of Broward County, Florida. Our program today has 526 active fathers and daughters participating in the program. There is a parallel Indian Guides group, the Teton Nation for fathers and sons. The Y-Indian Princess program is different from scouting, sports teams, and many other activities because it is specifically intended to be a parent AND child organization. Our members join the program specifically because father and daughter want to spend more time together.